I hope you all had a fantastic Thanksgiving and are recovering from the festivities! 1. 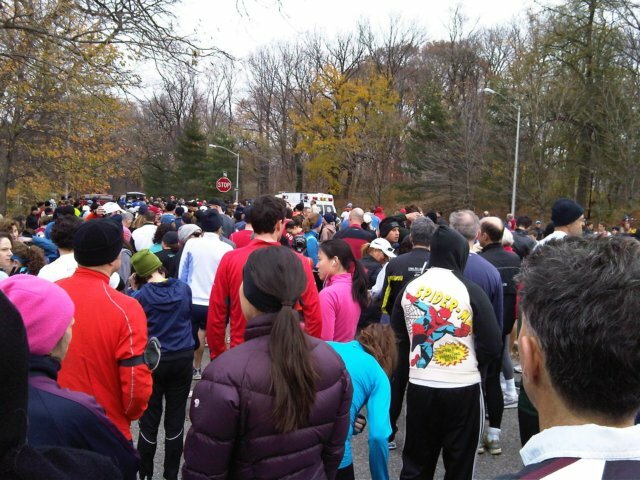 Woody and I started our day in Prospect Park for the Prospect Park Track Club Turkey Trot! We got out there much quicker than we expected and it was pretty cold, but it wasn't raining yet, which was key! We lined up with about 2,000 other people, including some fellow Spartans and a ton of really fast kids! Unlike NYRR races, this one started without any announcements, just a shot of a gun and we were off! 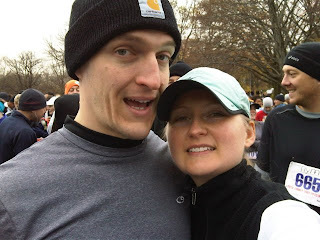 I've never run in Prospect Park so the whole course was new to me. Woody hung back with me for the first half mile and then took off ahead of me. We did two loops of the park - one small, one large - and just before during mile 3 we hit a long hill. April had warned me about this ahead of time so I was prepared, but I didn't realize it would last about .75miles! It wasn't very steep, but it was long and turned quite a few runners into walkers. I was very proud of myself when I hit the top, turned the curve and headed back down the hill! What a relief! I soon saw the 3 mile mark and knew I was on the home stretch. With about a 1/3 of a mile left I saw April running back the wrong way (who had a great day with a PR and came in 3rd for women overall!!) she jumped back in with me and ran for a bit. She naturally pushes me so I picked up my pace a bit and held it till I got in the finish shoot, saw Woody on the sidelines and kicked it as hard as I could! I passed about 4 people with about 50 yards left. It was a great finish! I still used quite a few Kleenex's during the 5 miles, but I made it to the end without too many issues. I finished in 45:20 with a 9:04 pace, which I'm really happy with. Woody finished in 39:46 with a 7:58 pace. This was just his second race, he's incredible! 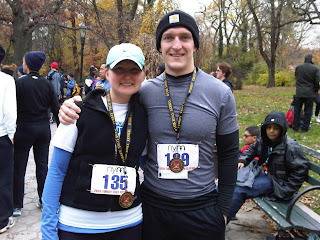 We loved the medals and hot cocoa at the finish. It was a fun race and we may just make this a tradition! 3. We do not do Black Friday. Instead, we have made today a 'do nothing' day! We didn't set the alarm and slept in until almost 9am. I don't think that's happened since we were up north in June! Right now, we're just hanging out, watching TV and not doing much of anything. It's great! 4. Tomorrow is the last MSU football game for the regular season. As has been tradition for many years now, we play Penn State in Happy Valley. We definitely need this win to keep our little Rose Bowl hopes alive, but the Jo Pa's team is going to be tough to beat. Woody and I will join fellow Spartans at one of our bars in town to watch the game. Two years ago we went to the game - it was about 11 degrees and snowing all during the 6 hours of tailgating we did with friends. It was fun, but I'm glad we'll be in doors and warm this year! I think this is a sign that we're getting old. 5. I admit it, I'm an advertising geek. I don't really work in advertising (although I kind of do) but I am really intrigued by new techniques and ideas. I also love new marketing ideas and how events are adding value to sponsors. I know, it's weird that I find this so interesting, but I really do. Anyway, a few days ago while researching some things on creativity-online.com, I came across a feature about how Asics was supporting runners along the course of the ING NYC marathon. It's a pretty ingenious idea and to put it into action is even more incredible. This video explains how Asics and their agency, Vitro, allowed family and friends to support their runners as they ran through the streets of NYC. How was your Thanksgiving? Did you wake up early this morning for 'Black Friday' shopping? Congrats on your race! Great Job!! That was a great video about the marathon! 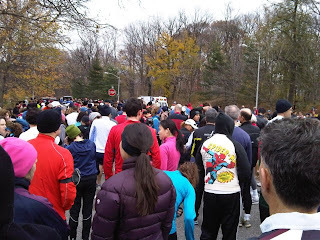 And I love running in Prospect Park! It's beautiful! Tough course, but it's great! awesome job at the race! yeah for a fun race and yes it should be a tradition! glad you had friends to celebrate with too and no black friday madness here either! You rocked that race! Love that pic of Woody!